At first glance, gaming and parenting seem like they go hand-in-hand. After all, kids love games, and gamers obviously do too. The truth however is that children and adults often love very different kinds of games. Young kids in particular love play that is imaginative, activities which stretch the brain and require a near-constant level of creative investment that many adults can’t keep up with. Having a kid is like playing a narrative-rich RPG for 10-12 hours per day, every day, for years on end, with the most demanding and fickle DM you can possibly imagine. It’s fun, sure, but it’s also hard work. So when bedtime finally rolls around and my wife and I have a few minutes to ourselves, it’s often difficult to find the energy to play a board game. Balancing babies and board games is a tricky business. Trying to learn new rules — or even remember old rules — is challenging. Anything which requires a massive amount of set-up or has excessive downtime between turns is right out, as is any game which requires complicated math. And of course it needs to be playable in two hours or less, since our own bedtime is constantly looming. There aren’t many games that can meet all of these conditions and still play well with just two players. Here, though, are the best that we’ve found. In a pinch, your child’s toys could even serve as game pieces. This pastoral 2-player spin-off of Agricola bears relatively little resemblance to the original title, but it’s one of our favorite go-to Eurogames. There’s just something exceedingly pleasant and personal about building up your little farm, making sure you have enough space for all the animals you want— even if sometimes that means you have to keep a horse in your house for a bit. While there are several viable strategies, none are overly elaborate, which leaves us both satisfied with a win and not too disappointed with a loss. This classic was recently reprinted in a single box containing the base game as well as its two expansions, so be sure to pick up a copy! 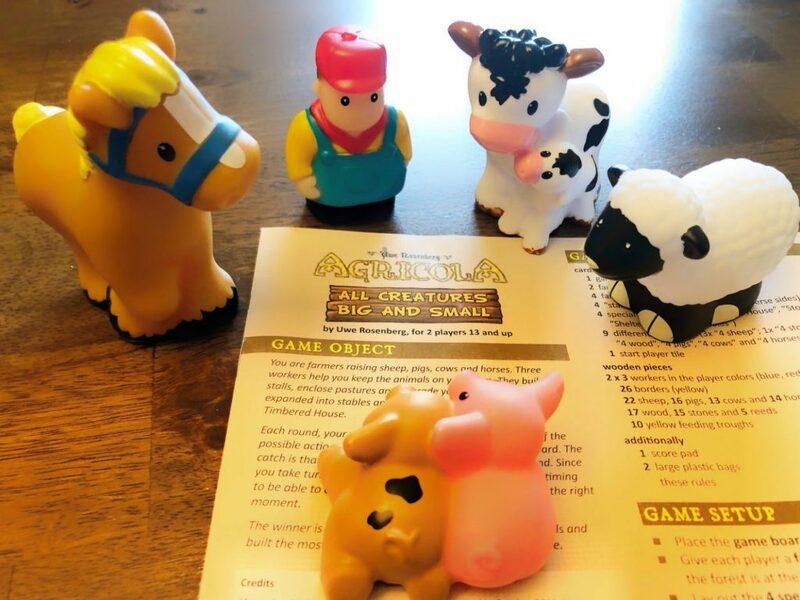 Read our review of Agricola – All Creatures Big and Small if you’d like to know more. 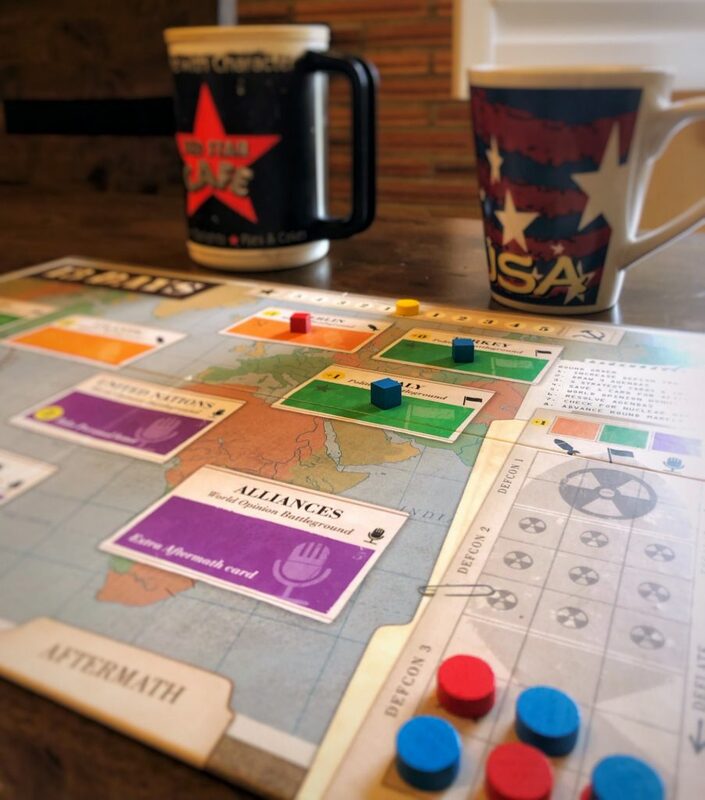 Before we had our daughter, the game of choice for my wife and I was undoubtedly Twilight Struggle, which promises to play through the entirety of the Cold War in one gripping evening of cards and counters spilled across the map. While I’ve heard of people playing it that fast, we preferred to stretch a single game out into a weekend affair, agonizing over each difficult concession to the opposing side, mulling over the board with our morning coffee or evening wine, laughing at inside jokes carried over from the last game. It wasn’t so much a board game as an event. Suffice it to say, 13 Days isn’t going to completely capture that spirit, but it echoes so many of the things I liked about Twilight Struggle in a much more accessible, time-friendly package: the tough decisions; the constant jockeying for position; the feints, bluffs, and counter-bluffs; the sense of history being made or unmade on the coffee table. Though slightly more complex than some others on this list, any experienced gamer should find it manageable, and the payoff is absolutely worth it. Get into the spirit of the game by adding thematic accessories. Arcane Academy flew under the radar a little bit, presumably because the name, theme, and packaging are all fairly generic. That said, this game of teenaged wizards trying to complete their homework is easy to learn and perfectly paced. Turns rarely take more than 2 minutes, yet players can pull off deeply satisfying combos that feel like a natural culmination to good planning. As a bonus, it can be played with more than 2 people should you ever have the chance, and could be played with older kids. I haven’t had as much time as I would like with this game, but like many gamers, I’ve played countless hours of Magic: the Gathering over the years. As much as I miss it, the thought of sorting through thousands of cards to build a new deck fills me with dread. Consequently, this lightweight descendant of the old standard really speaks to me, and it hits every single mark for tired parents: minimal set-up, easy rules, fast turns, a moderate level of strategy, and pretty fun to boot! As 2018’s Spiel des Jahres winner, Azul is anything but a surprise pick. Still, it’s hard to overstate just how fantastic this game is. It’s accessible and light at the beginning, but can get quite competitive in the later rounds. It’s thoroughly satisfying when your plans pay off, and there’s a lovely aesthetic to the color of the tiles and the way they plonk and click as you handle them. One note of caution for all you tired parents with smaller children: the tiles used in the game resemble a certain brand of chewy candy squares and should always be thoroughly accounted for at the end of a play session. 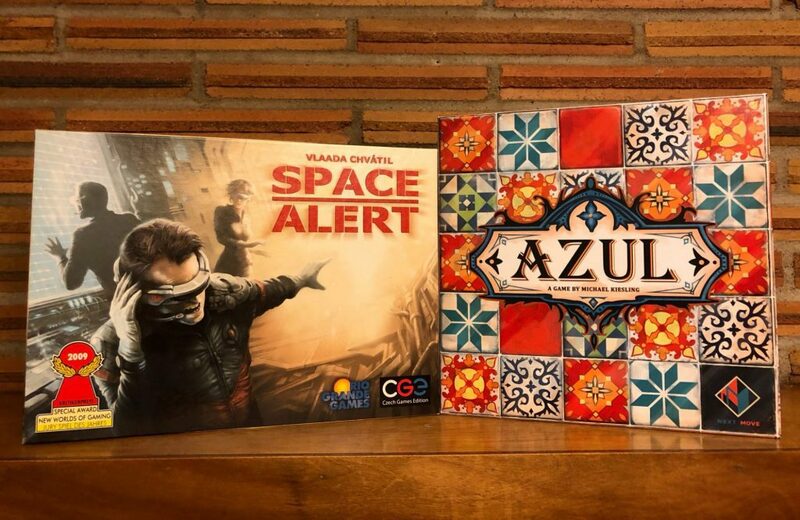 Read our review of Azul if you’d like to know more. At first blush, this may seem like an odd choice. A fast-paced, brain-melting co-op programming game of doomed astronauts trying to save their imperiled ship doesn’t really fit most of the criteria I mentioned. It’s got a fair amount of set-up, has some moderately complicated rules, and requires players to make choices between equally bad and complex options under a brutal time crunch. All that said, what earns Space Alert a place on this list is that it’s one of the few games where being tired can actually make the game a lot more entertaining. Because the game is such a chaotic mess most of the time, making a few bad decisions due to fatigue is just par for the course. My wife and I have consistently found ourselves doubled over with laughter as one of us confidently stands at a laser, using our limited energy to fire shot after shot after shot at a long-vanquished enemy, while some tentacled alien on the other side of the ship goes completely unimpeded. Since each round of the game has a firm 10-minute time limit on actual play, it’s also relatively quick, and the overall high difficulty level (especially for two people, since it’s designed for four) gives it a lot of replay value. As with all top 6 lists, these are just my personal picks. I’d love to hear what other parents out there are playing with their limited free time. Thanks for reading! Great article!! Board games are a wonderfully fun & stimulating way to spend time with your significant other, especially when you time is limited. Thanks for the recommendations!